A little over 2 years ago, i decided to quit my job to become self-employed in Germany. After years spent in the cosy realm of full-time employment, i took a leap into completely uncharted territories for me. I was excited, i was motivated and with no regrets. Soon thereafter however, i was facing a little mountain called bureaucracy. To become a freelancer in Germany was not going to be easy but with my best efforts and a little help, i did go through that challenge unharmed. This guide is an attempt at transferring my experience to spare you some sweat, tears and stress. Disclaimer: Please note that this is an attempt at covering an excessively broad topic. You might want to prepare a cup of tea before diving in. It’s a whale of a read. The difference between freelancer & self-employed: which one are you? How do i communicate with the Finanzamt? What does the process for the yearly tax return (Steuererklärung) look like? Which expenses can I put off in taxes? Do i need a special business bank account? Can i combine a normal day-time job together with self-employment? Freiberuflich or freelancer: it is one specific type of self-employment that is limited to only a certain number of liberal occupations. Those professions are often linked to some sort of scholar, academic or creative service, as defined in income tax law here (EStG § 18). Those can range from dancers to doctors, from architects to journalists, from lawyers to programmers. Freelancing in Germany does not require to register a business which involves less paperwork. Gewerbetreibende or tradesman/business: this is linked to all other kinds of occupations that don’t qualify for the official freelancer definition. Any other sort of commercial entreprise usually falls under the classification of business in Germany. Most often than not, it is about building, trading or selling physical stuff. In this case, you will need to register a business (Gewerbe), which explains why the term “Gewerbetreibende” is used to differentiate this category. If not, just click on the link for each topic. It will redirect you to another guide on this blog. Registering as a freelancer in Germany is a fairly straightforward process as it doesn’t involve registering a corporation or getting trade permits. However, please hold in mind that some occupations will require a specific degree to be able to do freelancing in that field. Fill in this form (Fragebogen zur steuerliche Erfassung). It’s a small questionnaire to let your Finanzamt know that you plan to become a freelancer in Germany. You can fill-it online, save it or print it when you are done. If your German is a bit sketchy, you can use this little guide or get help from a German friend. Bring it to your local Finanzamt. If unsure, which one is yours, you can check this here. Receive your new tax-ID (Steuernummer), which you will put on all your bills from now on. Additional pieces could be health or regulatory permits (for opening a café for example), certificate from trade offices if you are going into a particular skilled craft sector or if working with children, a certificate that you don’t have a criminal record. If you are unsure about this, get in touch with your local Industrie- und Handelskammer – IHK (Chamber of commerce); they will tell you about all the permits you need for your activity. 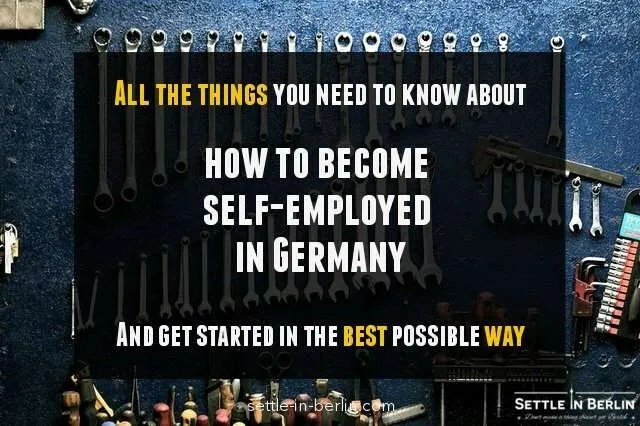 I’m not covering here other business structures such as UG, GmbH or GbR as this post is aiming at one-man businesses and at how to become a freelancer in Germany. It usually requires to go in front of a lawyer to establish the corporation, and registration at the local IHK first (Handelsregister). Going with public companies (Gesetzlichen Krankenkasse) means that yours fees for health insurance will be based on your income at around 15% of what you earn, with a legal minimum monthly fee of about 350€. This option is more costly, especially in the beginning when you don’t earn anything, but it does cover kids and spouse with you. Going with a private scheme (Private Krankenversicherung) means that the rate is based on your health profile and risks. Consequently, if you are young and fit in your twenties, you might have plans as cheap as 150€ per month. However, as years go by and your health is more fragile, it can quickly increase to 500€ or even more if you are in your fifties. Kids and spouse are not covered. Pick your provider carefully since they each have unique plans and different coverage at different prices. The offer is way more diverse than in the public system. It is recommended to meet a broker or use comparison platforms such as Tarifcheck or Preisvergleich.de to find the best fit and the best price. Artists & performers can have half of their fees covered by the KSK (Künstlersozialkasse) when they stay in the public scheme. People currently out of a job and registered at the Arbeitsagentur can apply for a Gründerzuschuss. It is a little grant which helps you pay your health insurance in the early days of your self-employment in Germany. As pretty much anywhere, a value-added tax paid by businesses (19% or 7% in Germany). Here, you can deduct the amount of V.A.T you paid on good or services you bought from the amount of V.A.T you added to your own bills. If you paid more than you received, the Finanzamt will refund the difference. This is paid monthly to the Finanzamt during the first 2 years and quarterly after this if you don’t collect so much V.A.T through your activity. Freelancers and other self-employed people earning less than 17.500€ per year can choose to avoid this scheme altogether by adopting the “Kleinunternehmerregelung” (Small business rule). This means that there is no V.A.T on your bills, but you can’t deduct V.A.T on things you bought either. This rule makes sense for smaller operations with little investment: less strain on the cash flow. Above this limit, it’s compulsory to bill V.A.T as well. You also need to register for an EU V.A.T ID if you plan to do business with clients outside of Germany. For freelancers and self-employed people, the income tax will apply to everything you earn with your small business. In Germany, there is a threshold under which the income is always tax free. In 2016, this amount was 8 652€ per year, i.e; any euro above this is taxed. The tax is due every year to the Finanzamt and should be declared before the 31st May of the following year. It is a part of your Steuererklärung. For the second or third year of operations, the Finanzamt usually decides to set quarterly installments instead, based on previous statements. This means that instead of paying the whole amount at once every year, you need to transfer a part of it every quarter. This has the advantage to be safer/smoother on your cash flow. This trade tax only applies to Gewerbetreibende. It’s an additional tax that applies on your overall turnover for the year. You are not required to pay if your turnover is below 24 500€ per year. It is due yearly to the Finanzamt and should also be part of your Steuererklärung, sent in before the 31st May of the following year. For high-earners, you can also expect quarterly installments too. It is highly required to use the government’s issued ELSTER tool to communicate with the Finanzamt. This software has all the forms required to be able to declare what’s relevant and do your tax return. I have made detailed guide about this topic this way. It has a lot more details and i will avoid making this post longer than it already is. Office space and equipment, also if working from home. Health, pension and other insurance contributions. You can find a more detailed list this way. How to properly account them for, i will cover them in the part about book keeping later on in this article. Becoming a freelancer in Germany (or simply self-employed for that matter) comes with simplified management, and that’s true for your bank account too. You can simply use your personal bank account if you already have one to support all your expenses and incoming payments for your operation. This comes with the risk of using your personal funds to support your professional life though. Make sure to separate both to avoid cash flow issues, especially if you decide to pay V.A.T as well. You can of course decide to open a second bank account dedicated to your professional life. If you need help on how to open a bank account in Germany, i have already made a dedicated guide this way. You can find a pretty nice excel template on this website. You can then edit them to fit your situation and your looks. At some point or other, you will get audited by the Finanzamt. This means they can ask questions on anything. Keeping the records straight will avoid headaches and conflicts, especially if it’s about 5 year old items. Every year until the 31st May, you will need to do your tax return (Steuererklärung) and communicates how much in total you earned during last year, this can be done in minutes if things are kept clean, not hours. You can account for all small expenses you had during the year, which will add up to a lot to reduce your taxable income for your tax return to. This requires properly recording and filing each bill you received, physical or not. For this, a simple excel sheet will do if you have patience and you are rigorous. This page has a pretty neat Excel template (especially for Gewerbetreibende). This involves a manual entry for each item in a table divided by month. It’s also hard to keep a copy of each bill when you have expenses. Lexware: Consistently awarded by “Praxis Tests”, trusted by Steuerberatern and used by thousands of small business owners and freelancers. It is a reference in Germany and covers all of your accounting, invoicing and tax returning. (From 10€ per month – Interface in German only). Reviso: Formely know as e-economic, it’s also making a name for itself with its KPMG-certified software. Unlike its competitors, the different prices and plans don’t limit features but simply the amount of entries. (From 10€ per month – Interface in English & 6 other languages – Free trial month). Zervant: A simple to use tool to manage your invoicing. It only does that but it does this well and most of all: it’s for free. Remember if you pick one of the paid options: this would count as an expense you can put it off in taxes too! It’s money well invested. Using a Steuerberater can appear costly but it’s often worth it when you are starting to earn well. The bet is that the benefits/return will off-set the expenses. Their fees are usually paid monthly if they are involved with the daily accounting business and/or yearly, if you only need help for the tax return until the 31st of May. The costs of hiring Steuerberater is often well worth-it as it will optimize your expenses & maximize your tax return. You can often greatly reduce their monthly fee by using one of the bookkeeping programs mentioned above. This is because it’s much less work for the Steuerberater to collect and process information through an export function than to process an excel sheet. Those software usually have a special access for Steuerberater made especially for that. If you don’t know where to start to look for one, you can use platforms like Ageras which connects freelancers to English-speaking Steuerberater all across Germany for free. More info on how to find an English-speaking Steuerberater in Berlin here. Make it in Germany: A government-owned website for skilled-workers wanting to move to Germany. It has information on setting up your own business. Existenzgründer: Another great government-owned website that gives a lot of details on how to become a freelancer in Germany. It works for each profile of self-employment. It’s available in other languages but it is most complete in its German version. Yes, it is possible, provided you don’t do more than 18 hours on top of your full-time job. If you are very successful and can somehow earn more with your side sig than with your job, keep in mind that you will have to start to pay your Krankenkasse contributions yourself then. In turn, your net salary should increase, since your employer doesn’t pay those contributions anymore. Ps: please note that despite all my best intentions, some of this information can be inaccurate or missing details. I urge you to talk to a professional coach, especially if you are preparing your freelance visa from abroad. Let me know in the comments if you spot something unclear that needs improvement or if i should cover something more. I am currently living and working in Denmark as a freelance videographer. I am considering going to Berlin for some periods to collaborate on projects, and assume that I would then have to register as a freelancer in Germany. But since I am already health insured in Denmark, would I have to be insured in Germany as well to be working there? Thanks a lot! Hey Mikael. You don’t necessarily need to register here as a freelancer to work in Germany. If you remain a Danish resident, you could consider those periods of time business trips, and bill from Denmmark and be insured there. As per my understanding for the first year as freelance you cannot pay income tax quarterly. You are supposed to pay during tax returns next year. From second year onwards you can pay quarterly. Is my understanding correct? Okay, not sure if this can be answered but here we go. If from the UK and setting up an online business, can I be registered in Berlin but do all the tx etc from the UK? By that I mean be a UK paying resident of business and located and registered in Berlin? Thank you, love this site!!!!! Hey David. If you are an English resident and you work as a freelancer (not a registered business), then you need to be paying taxes in the UK. Hey David. Yes, simply let them know about your new situation. Hello Bastien, thanks for all this information. I see you have mentioned health care, but what about pension (or social security fees? ); I red that with net revenue exceeding 450€ per month, it is mandatory to pay for the social security pension scheme, around 18% of monthly income. Is this correct? If yes, where should we register? Many thanks. Hey Delphine, this would be dealt through the Krankenkasse as well. You can chose to opt-out of certain contributions in some cases. Hi! Is ok if I have a part time job with a contract and I also want to be a freelancer? Thanks! Thanks Bastien for this great and useful article. Can I have a question? I am a Vietnamese and having a dependent Visa attached to my wife’s student visa (3 years), ending this September but we are going to extend the visa. So, in this situation, could I myself apply for a freelancer visa? I am a translator/interpreter. I had my Steuernumber already. If i have a freelancer visa in Germany, can I work in another Eu countries? I would really appreciate if you can give me some hints on this issue. Thank you very much for your kind help! Hey Vinh. Have you looked at this post? It may give you the answers you are looking. I am currently a student (non-EU) in Germany and recently got a job as a consultant in another country for 6 months. I will be working remotely. My question here would be can I still be a student and register myself as a freelancer or is there anything else that I need to do or is it okay for me to do nothing and continue being a student? Also, I was wondering if I can still be a student in Germany and work in another country in a working visa for certain months? Hey Louie. You need to look at what your permit says but in theory, a student visa allows 20h working hours per week. For the rest, you’d need to ask a immigration expert. Hey Bastien, such worthful post mate, I am an employee as an architect, and i have got a small project from a friend which i would like to do as a freelance architect. this will be a one-time thing, how should i take care of the tax for this situation? any suggestions? Hey Salah. No half-way solution i’m afraid. You’d need to register and everything if you want this to be done by the books. Hey, Bastien, first of all congrats for all Info above. I have a situation here and dont know what to do. I have a midi Job and now i have a opportunity for one Job as a free lancer, but is just one invoice, one month. Can i still with my midi Job , and my Public insurance paid by the actual job? Hey Marcos. Not sure i understand your situation? Both minijobs and freelancing arent paying for health insurance…? You rock, mate. I can’t believe that such a valuable information is available for free. Thank you!! So, after reading this post, and applying it to my situation, I need to take following steps. Please be kind and take a look. Thanks in advance. 3) I already know who would be my client once I start freelancing. So, I go to them and start working. a) Do you think the steps I listed above or correct and in order? b) Do I need any contract from the client before I go to work for him? c) Considering an annual income in excess of 80,000€ gross, what is the approximate tax I end up paying (tax class 4)? I know you have already explained a bit of tax, but I couldn’t get my mind around on the exact % of deduction. d) Once I get my freelance permit, am I legally not allowed to do full time job at all? For ex, if i change my mind after getting a freelance permit and want to continue my regular job. a) yes, provided you sort out your freelance visa before. b) a letter of intent (several actually) would be needed if you needed to apply for a freelance visa for Germany, as described here. c) More about income tax rates there. d) Hard to say on so little details. Hi Bastien – are the Freelancer forms here still the same for 2019? I noticed a lot of forms on the Finanzamt website looked a little different. Also I got my spousal visa in late December 2018 for Berlin, will I be fined by the Finanzamt for only registering as a freelancer now? The forms are changing from time to time. The ones for 2019 are not out yet. You won’t have any issues with the Finanzamt if you didn’t do any freelancing without registering as such first. Hi, I live in Germany for 6 months now and I have a work permit related to a company. Do you know if it is possible to change to a freelancer visa, but working for a company outside Germany? Hey NQG. You should check if your residence permit allows you a freelance activity under your current visa. Look for “”Selbständige Tätigkeit gestattet”. If that’s not the case, it is possible to apply for it but then you lose your current visa the moment it is granted to you, and you can no longer work for this company. Giving it a go with only a foreign company as client is probably not going to work though. Refer to the post about freelance visa application for Germany. Firsts things first, i cant believe all this content isfree. thank you for that. 1. if my visa allows to do freelance, do i still need to change it to complete “freiberufler” or i can just quit my job , inform foreigners office and continue with freelancing work on my current visa? 2. considering if the visa type has to be changed, what would be the duraiton of my new visa, since current visa still has 2 years validity, will that be considered? Hey Sandeep. 1- Hard to say on such little details. Better call this official hotline to check. 2- No idea. again call that hotline. If i plan to apply for the freelancer ID as a second job, is it the same process as you describe above? I have a letter from my first employer approving this. And if in the future a few years down the line, I want to become a fulltime freelancer I can still keep the same ID right? Hey Katie. Yes it’s exactly the same process. The Finanzamt doesn’t care whether it’s only a sid gig or not. Great Job Bastien. I’m a US citizen and I thinking to travel to Germany as a tourist, however one friend of mine has a maintenance company in Frankfurt and I would like to work for him for a couple months. Once I get my residence permit, which could be the best way to do it ? As a freelancer or as his employee ? Hey Enrique. You may not work here on a tourist visa. You’d need to either apply for freelancer visa or work visa. It’s usually easier to get a work visa. But it is worth the trouble for just 2 months?